Ian Coad is a very professional Celebrant with a great sense of humour. He cares about what your wedding ceremony says about you and your partner. He works with you to create a ceremony that is unique and special to you both. Ian Coad can make your special day really special. Have you attended weddings and been bored by the usual sugar coated words in the ceremony that had no meaning for you? That is why it is so important for couples to be involved in the compilation of their ceremony. By working together with me couples can produce something that will be meaningful and memorable that reflects their ideals, beliefs and hopes, but most of all their special promises to one another. Ian Coad was a wonderful celebrant to have for our wedding. We live interstate but Ian made the whole process very easy each step of the way. His demeanour is warm, professional and jovial and he made us feel relaxed on our special day. We are very happy with our choice and highly recommend him to any couple wanting to be married. My son and his now wife, chose Ian Coad to be the Celebrant at their wedding, which was held at an idyllic location in Merricks North, Victoria. The magical surrounds created a stunning atmosphere for this special occasion and added to the visual beauty and ambiance, Ian provided his own special and personal touches to this wonderful occasion. 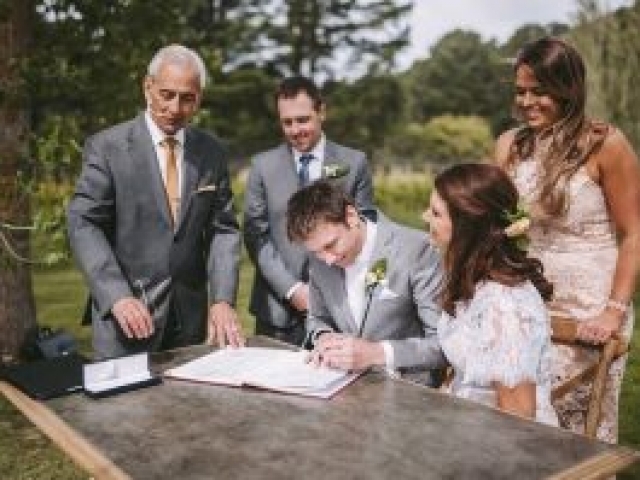 Ian’s professionalism, warmth, graciousness, sincerity, friendly, genuine nature and endearing qualities encapsulated a mix of authenticity, reverence and heart-felt meaning, coupled with touches of beautifully timed light-hearted humour to the ceremony. I have never attended a wedding in which a Celebrant has performed such a wonderful job. I highly recommend Ian as a Celebrant to officiate your wedding. Thank you very much for being part of our special day. It was important to us that we had a celebrant who understood us and help us put into words the love we have for each other. You did this and it made the day perfect. Thank you for everything you did for us. Best wishes.